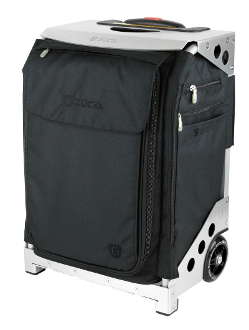 ZUCA Flyer Travel Black & Silver Carry-On Bag. You can easily fit between 6-7 days worth of clothing (depending on the season) into one of the best carry-on pieces of luggage you can own. Great for the professional or leisurely traveler. Also great as a weekender bag for competitive cheer, figure skating or dance. Easy to roll and even provides a place to sit at busy airports. Included are 5 color coded packing pouches, a TSA compliant toiletry bag and matching travel cover. Weight Frame and Bag is 9.3 lbs. Weight with accessories is 12 lbs.